Recently I’ve been spying these gorgeous, woven wall hangings. It’s a huge trend that’s rising in popularity and I’ve fallen in love! But, I don’t just want to buy one, I’m just desperate to dive right in and make one – aren’t you!? But, where to start? In step incredible weaving expert, Andrea, from Loom & Spindle. 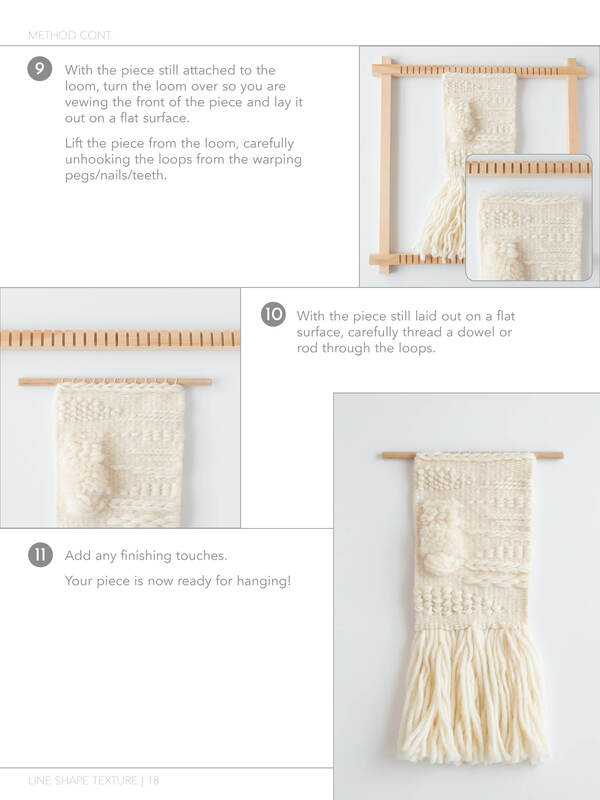 She’s agreed to givinste us a sneak peek of her new eBook and introduce a simple technique so we can create our own frame-loomed, woven wall-hanging right at home! 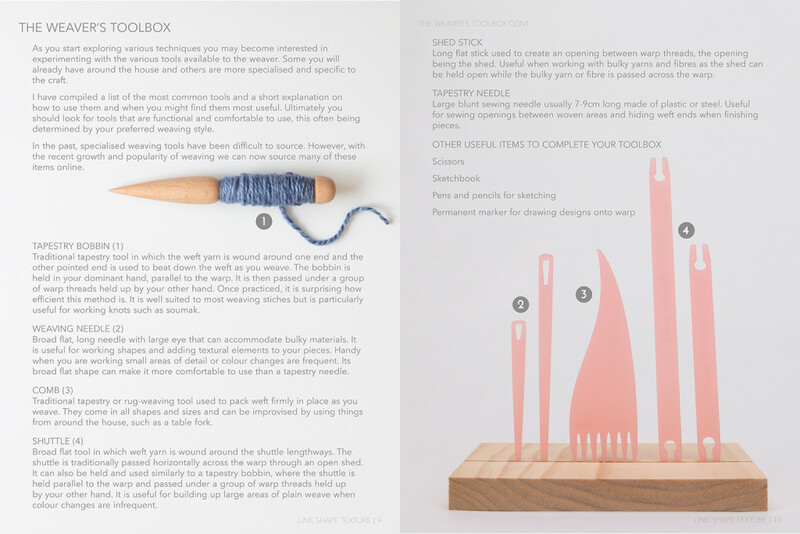 PLUS Andrea is giving us an amazing chance to win one of her beautiful eBooks, Line Shape Texture: A Creative’s Guide to Frame-Loom Weaving. We have five to giveaway to our lucky readers! Hi, my name is Andrea. I’m a self-taught weaver, hand spinner and creative thinker from Melbourne, Australia. I launched my business, Loom & Spindle, in 2014 to share my passion for textiles and teach others about the craft of frame-loom weaving. My most recent project is an eBook, Line Shape Texture: A Creative’s Guide to Frame-Loom Weaving, which guides the beginner weaver through the language and technique of frame-loom weaving. 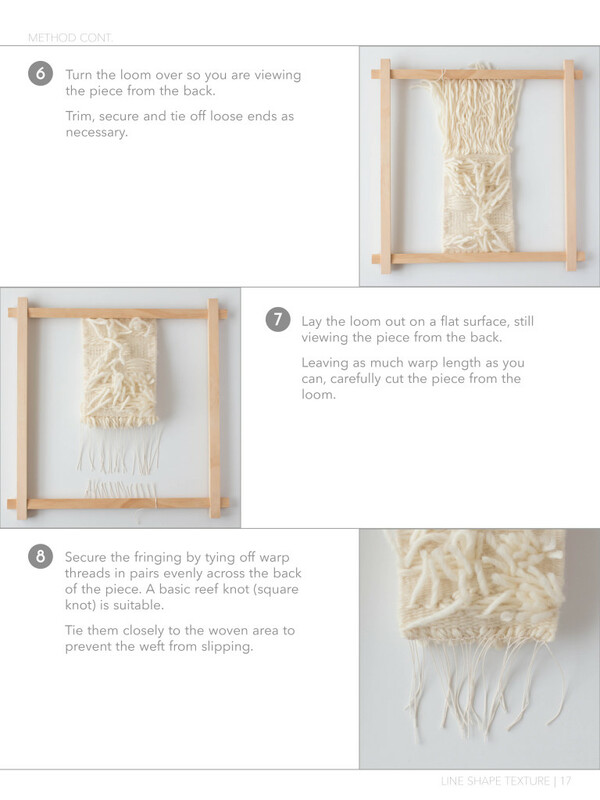 Frame-loom weaving is growing in popularity and is an amazing activity you can do at home. 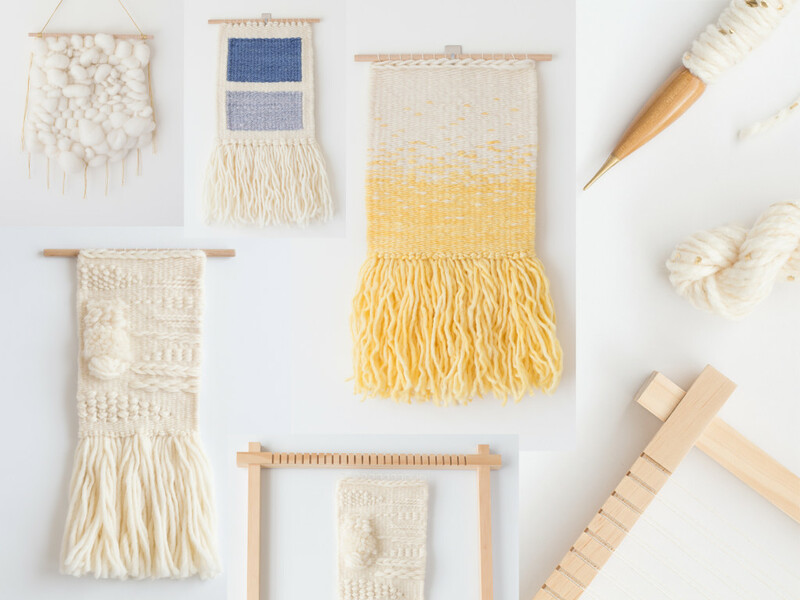 I hope by introducing you to this craft and sharing my simple method for creating your own woven wall-hanging, you’ll try it for yourself and get hooked, just like I did! Frame-loom weaving is a weaving method closely related to the traditional techniques of tapestry. A dense woven fabric is formed by hand, your fingers working individual threads to create shape and build texture. This free-form process enables you to explore geometric and pictorial themes in your weaving and combine textual elements to create three-dimensional form. Overall, it is a gentle and organic approach to cloth making. To begin, the only tool you really need is an inexpensive frame loom. They come in all shapes and sizes and if you’re really handy you can even make one yourself! A frame-loom usually consists of a timber frame with a series of nails, pegs or teeth along two opposite ends on which the vertical threads, the warp, is wound and held firm. Its construction should be simple and robust so that the warp is held under tension and evenly spaced while weaving. For a beginner, I recommend a loom with a warp spacing (sett) of 4 warp threads (ends) for every 2.5cm (4 ends per inch). This wide sett tends to cover quickly and will suit a range of materials and projects. As you start exploring various techniques you may become interested in experimenting with the various tools available to the weaver. Some you will already have around the house and others are more specialised and specific to the craft. In the past, specialised weaving tools have been difficult to source. However, with the recent growth and popularity of weaving you can now source many of these items online. A good foundation is necessary to give your woven piece functionality and durability. The technique I present here is a simple and straightforward recipe for constructing a woven wall-hanging. It is a unique method in that the design will be woven upside down and only turned the right way up to add the finishing touches at the end. It is particularly suited to woven wall-hangings as it results in evenly spaced loops at one end to hang the piece. Though, the method can easily be varied to accommodate other projects such as home furnishings or personal accessories. 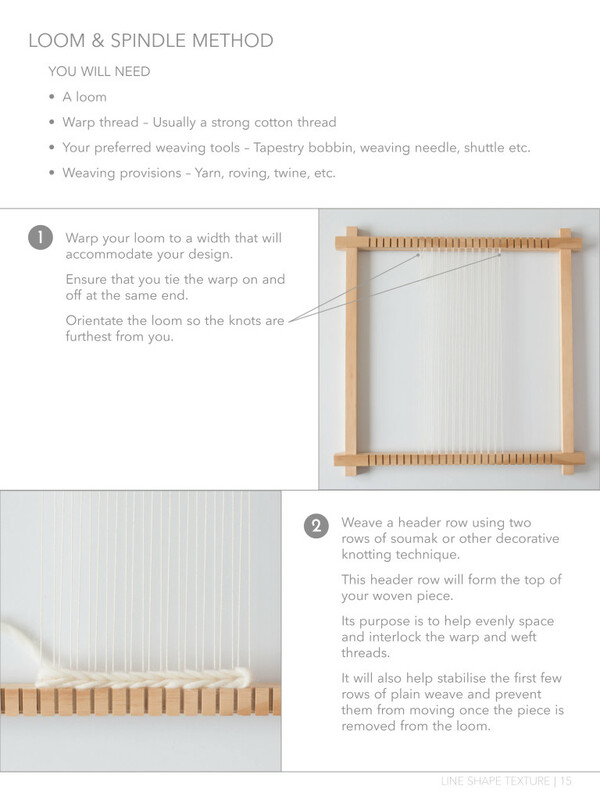 *For guidance on warping your loom please visit for our free guide on the weaving resources , How to Warp a Frame-Loom. 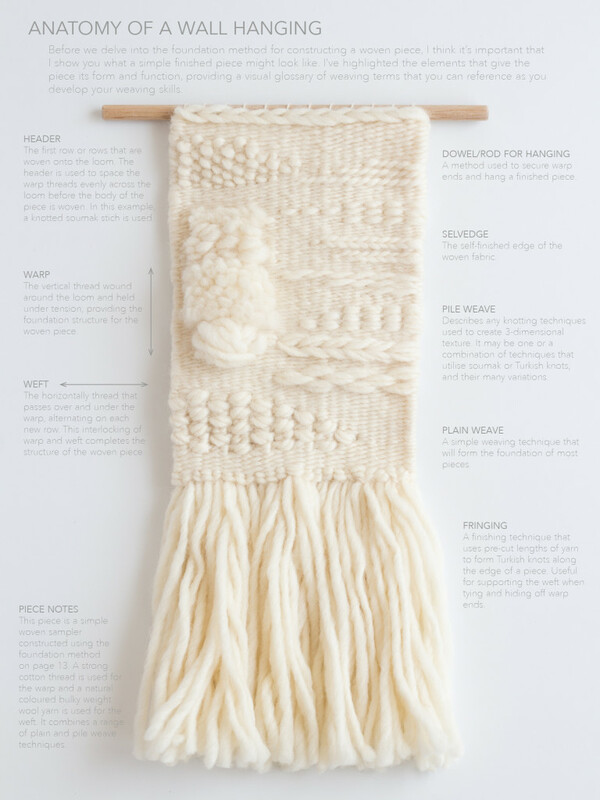 Line Shape Texture: A Creatives Guide to Frame-Loom Weaving, By Andrea Rothwell, will be available for download on June 30. download your free sample. 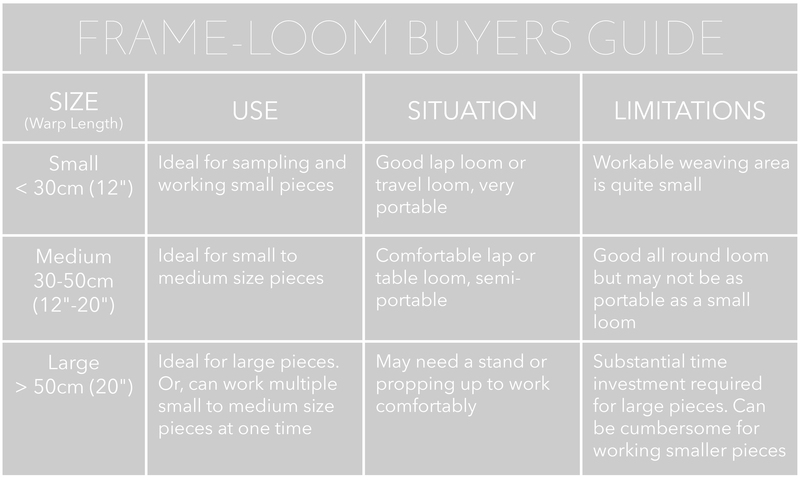 This new guide will introduce you to the language and technique of frame-loom weaving. Foundation skills and key elements of woven design are presented together, giving you a thorough understanding of how woven pieces are formed. It will help give you the confidence to design and plan your own successful pieces and will quickly become your go-to weaving reference. “When I sat down to write this book my aim was to create a guide that would not only give you the foundation skills of frame-loom weaving but provide a framework in which you could express your creative self. For this reason, I haven’t included projects, but instead provide discussion on how foundation skills can be varied through design and application. I’ve drawn on my own experiences and extensive weaving library to provide you with an accurate and authentic guide to frame-loom weaving. I hope by sharing this knowledge I can help you achieve creative freedom in your own woven pieces.” Andrea Rothwell. Thank you SewObsessed for letting me share my passion project with you. 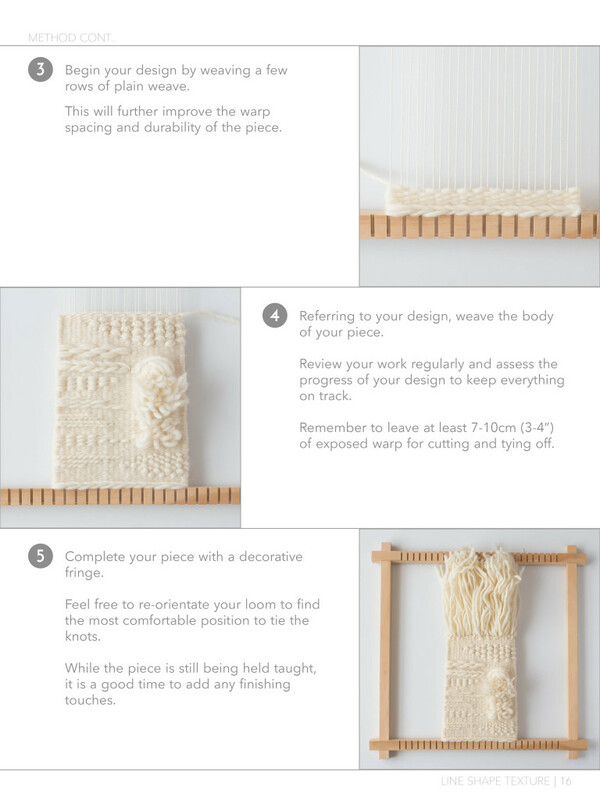 I hope it gives you that little spark of inspiration to give weaving a go for themselves! Follow loom and spindle on Instagram and like on Facebook for more new, updates and techniques. Facebook: Like and share this post. I want to win a beautiful @LoomAnd_Spindle eBook! Thank you Andrea! I for one am definitely going to give it a go! Make sure you’re signed up to our monthly newsletter to receive more amazing blogposts from us. Tweet this article with the links below. I hope I win the @LoomAnd_Spindle ebook!